As a teenager, I knew I was called to serve the Lord. It was evident I had a servant’s heart for ministry. Lucky for me, my high school sweetheart and I had separately pledged our lives to serve the Lord in full-time ministry. Not too long after that, we found ourselves engaged to be married. College, a wedding, bills, jobs, children and a mutually high dose of lacking confidence soon joined in the mix of our life plans. We found ourselves serving the Lord where we could, a mission trip here, leading a children’s ministry there, and thinking that maybe we had been mistaken about our calling. In 2014, The Joy House came into our lives unexpectedly. We had never heard of such a ministry that would potentially allow simple people like us join in on their mission full-time. Following some desperate prayers, I knew this ministry would be a part of our life story. Sure, we had to get hired, quit our jobs, break the news to our local family and church and move an hour north, but I just knew it was all going to work out. Without fail, in a short few months’ time, it did work out. We were ecstatic. Our calling to work in ministry full-time was being fulfilled. We became houseparents at The Joy House in May 2014 and to be honest, in many ways it was easier to do than anything we had ever done before. Don’t get me wrong, it was not an easy job, but my husband and I were so certain that God wanted us to be houseparents that even the bad days (and believe me we had quite a few) were bearable. The job itself was trying, emotionally and even physically draining, but it was right. With confidence we could face the scoffers in our lives and sometimes even within our own minds because in our souls we knew that we were right where we were supposed to be, doing exactly what we were supposed to be doing. Then, out of nowhere, after 3 ½ years in, things changed. At the end of 2017, we knew our peace about continuing to be houseparents had lifted. It was spontaneous and very scary to think of moving on from something we loved so much and had felt so right about, but we knew it would be a disservice to the Lord if we continued to stay. We moved out of The Joy House boy’s home the last week of December 2017. Our transition out of our houseparent roles made for a very interesting 2018. In less than a year’s time my husband had four different employers, I switched job roles, we purchased two homes, we sold one home, my children switched schools twice, we moved twice, we left a church body we had grown to love and we reunited with a church home we had been absent from for over four years. 2018 was a busy year. It was beyond busy. It was exhausting. The whirlwind of 2018 brought me face to face with many challenges. My family had certainly experienced pain and loss prior to this year, but in 2018 all four of us seemingly faced multiple crushed dreams and major disappointments. Even our bodies were physically breaking down from the stress and struggles. We were a broken mess and I found myself questioning my God who seemingly wasn’t putting our pieces back together again. I did not understand how our family, particularly following such faithful service in ministry at The Joy House, would be facing so many trials. I had let go of the scripture that reminds us that we are called to be longsuffering. Things weren’t happening the way I thought they were supposed to, and I was frustrated, hurt and scared. There were a handful of days in 2018 that I wanted to give in to the temptation of quitting. I wanted to just fold myself up and say “that’s it, I’m done, this isn’t worth the struggle.” Thankfully I wasn’t alone on those days. When I could find the discipline to be in God’s word, it would always breathe hope into me when my lungs felt empty. When I would make it a priority to worship my Savior, my praise of him would always humble me and remind me that my aspirations and plans did not really matter in the grand scheme of things. My husband, who I had often joked with others about him having “the patience of Job,” would ever so graciously steady me. He would point me to the truth when all I could hear were lies. He would point me to our Lord who had so faithfully brought us from brokenness before and created something better than we could have ever imagined for ourselves. Even The Joy House, which had been a ministry I had poured my heart and soul into for others, was now pouring into me and my family through the Counseling Center. In the fall of 2018, hope reclaimed its territory in my mind where deceit had imposed. 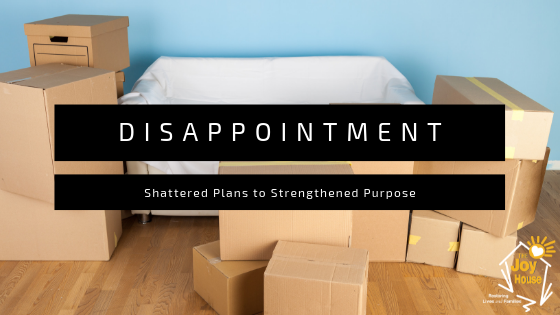 As plans began to unfold for another big transition for my family, I started to see that without the disappointments over the past year, our minds would have likely been callous to the opportunity to serve the Lord in a role that is now seemingly a perfect fit for this season of our lives. In November of 2018, we sold our Pickens “dream house in the woods,” as my husband calls it, and purchased our new home in Cobb County, GA where my husband was hired as a full-time youth minister. Some dear friends and faithful men and women of God surrounded us during this transition. It was exhausting and chaotic but there was no doubt that God was at work in putting our pieces back together again. As we celebrated the beginning of a new calendar year this month, I was quick to say “I hope 2019 is a little more stable than 2018” and that is an accurate knee jerk reaction to how I feel about the prior year. However, when I look at this past year from a gospel perspective I am overwhelmed with gratitude. I am grateful for the Lord making a way when there seemed to be no way. I am grateful for the Lord’s people that rallied around me bearing my burdens with me as we are called to do as believers. I am thankful that now, having experienced 2018, I have even more compassion to give to those who come into my life experiencing similar heartaches and disappointments as I have. I have no idea what 2019 will hold for my little family of four. Inevitably some things will not go as I had planned, but there is one truth that I plan to cling to from the past year’s experiences; I know that I will ultimately be ok following disappointments. Yes, I’ll have to wrestle with my mind to fight the temptation to fear and quit, but for the rest of my life, I can reflect back on this prior year as a testimony of God’s provision, mercy, and grace for my family and a motivation to show compassion to others in their own season of disappointment. If you find yourself in your own season of disappointment, I encourage you to cling to God’s word, surround yourself with his people and reflect back on the times in your life that God made a way. He is the author of peace and he is able to create something stronger from your broken pieces. 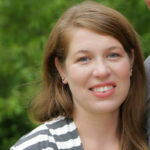 Ali Metcalf and her husband, Richard, served as Houseparents in The Joy House Boy’s home from April 2014 until December 2017. Following their transition, Ali was given the opportunity to join the administrative side of the ministry taking on the part-time role of Director of Communications. The Metcalf family lives in Cobb County, GA where Richard serves as the Youth Minister at Floyd Road Baptist Church.